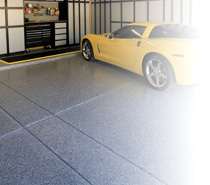 Our polyaspartic garage floor coatings are the best in the industry for a reason. We like to give our customers the best products, and our polyaspartic coating offers excellent color and gloss rentation, and are also availbale in a wide variety of colors. Featuring an advanced chemical coating technology that is significantly more UV stable, impact, abrasion and chemical resistant than most epoxies on the market today. Our state of the art chemical formulation allows our coating to be approximately 3-4 times stronger than epoxy, and UV resistant to yellowing, fading or chalking. The application time is merely 1 day compared to the leading epoxy coating which can take 3-5 days to install. We'll have you back in your garage the very next day! Standing behind our product we are proud to offer the Industry's best garage floor warranty. Utilizing a new generation of fast-curing materials we are able to apply a polyaspartic garage floor in temperatures as low as -20°F/-29°C. Our 3-coat polyaspartic system features one base coat, a pigment and chip coat, and a final clear coat. We also offer a 4-coat system. Fast cure times allow us to do 1-day installations, and you can drive back on the floor in 24 hours. Contact your local dealer for more information. Our Polyaspartic garage floor coatings are not just for the garage. You can have a great looking, easy to clean floor coating on virtually any surface! Polyaspartic coatings can be the solution to practically any coating problem, you name it and we will do our best to coat it. Featuring more advantages than Epoxy, and can be less expensive than fancy tiles you can have any of our various styles installed in your home. Floors can vary by color, chips, and metallic pigment. Our new metallic pigments allow us to create a more unique floor coating. Our Metallic coatings are perfect for in the home, the office, restaurants, waiting-rooms/lobbies, etc... Don't wait any longer, contact us today to get your free quote!